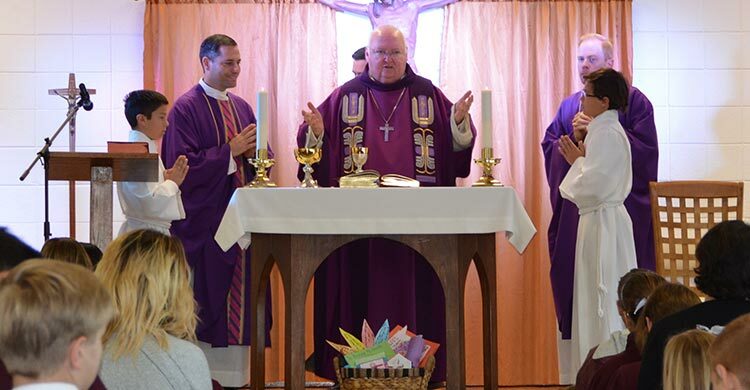 Bishop Patrick McGrath of the Diocese of San Jose visited Canyon Heights Academy the morning of March 2. He was warmly welcomed to campus by Dr. Margaret Richardson, Head of School and Fr. Anthony Sortino, Chaplain. He then celebrated Mass with the students, faculty and staff, and many parents. During Mass, Bishop McGrath spoke of the importance of following the commandments. Even though following the commandments and other rules in life can be hard, it is important because they provide the encouragement to be good. By following the commandments and rules, it makes us a better person and brings us closer to Jesus. Following Mass, he joined the parents for a reception and then visited classrooms throughout the campus. Beginning with the youngest students, he visited the Mommy & Me program, Preschool, Kindergarten, Lower School and Middle School. The students asked many questions, everything from clarification on the sacrament of Holy Orders to what type of phone Bishop McGrath carries. Canyon Heights Academy looks forward to his visit next year!